There are no remains on the presumed site, that of the present courthouse on English Street. The Earl, Hugh de Lacy, brought the friars there about 1235. It probably occupied the site of the Parish Church for on the 1729 map, Bridge Street was called Fryar’s Lane while Church Street and the gardens on its eastern side are marked as Fryars Bog. It was burned by Bruce in 1316. 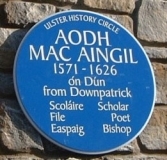 An Anglo-Irish foundation, Downpatrick friary remained Conventual right up to the Reformation. Despite oppression, the friars remained on until three were killed by an English force in 1575. Observant friars returned to the town in 1627 and remained until the Cromwellian period. 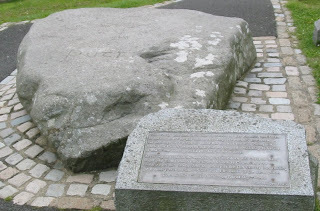 Driven out of Downpatrick in 1569, they returned the following year when three friars with local names (Fitzsimons, Rooney and Loughran) were hanged from an Oak tree near Toberglory which is now called St. Dillon’s Well. Eventually they set up a refuge at Drumnaquoile in the foothills of the Mournes from which they served a wide area of County Down until well into the 18th Century. For later history, see under Dromore. Aodh Mac Aingil 1571-1626 was born in Downpatrick.